Earlier this year, against all odds, Maryland banned fracking. The way it always happens. Fueled by a grassroots movement. 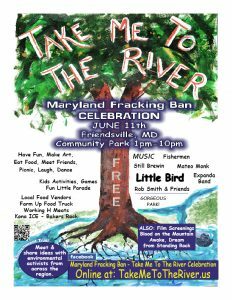 Now, the people who led that successful movement against fracking in Maryland are holding a celebration. This coming Sunday, June 11 at the Friendsville, Maryland Community Park from 1 pm to 10 pm. The community park sits at the confluence of Bear Creek and the Youghiogheny River. The celebration will feature speakers from other area environmental battles, including those fighting the TransCanada and Mountaineer Gas Pipelines being proposed to transport fracked gas from Pennsylvania, under the Potomac River and C&O Canal and Potomac River, through prime farmland in Morgan County, West Virginia and on east – probably for export overseas. Crede Calhoun, one of the organizers of the celebration, said any left over monies from the Maryland campaign to ban fracking will be earmarked for the fight against the TransCanada and Mountaineer Gas pipeline and for the fight against the Dominion Energy export facility Cove Point, Maryland. The celebration will include music from a number of regional bands, including Little Bird, Rob Smith and Friends, Still Brewin, Fishermen, Mateo Monk, and the Expanda Band. “Have fun, make art, eat food, meet friends, picnic, laugh and dance,” the poster for the event says. There will be local food vendors including Farm Up Food Truck, Working H Meats, Kona Ice and Bakers Rack. The web site is called – Take Me to the River. Weather five days out – sunny with highs in the 80s.